We are about to undertake a big room “shuffle”… it involves moving two kids to different bedrooms and creating a larger sewing and office space for myself. I can’t wait, even though thought of moving all of my craft supplies up 2 flights of stairs is a bit overwhelming to me right now. I’ve needed a larger space for a while now and I’m sure my family is sick of having the family room turned into photo studio… Basically the kid with the best light in her room (two giant windows) is getting kicked out so I can take advantage of all of that natural light. She’s actually pretty excited about moving to a different room, and has started to think about how she’d like to decorate her new room. 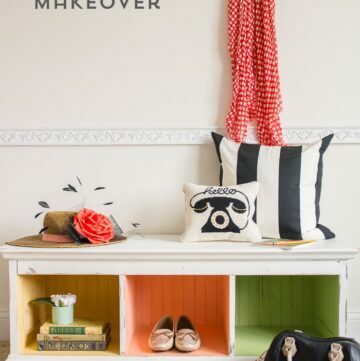 I don’t plan on buying anything new for her room, (maybe a thrift shop dresser) but rather move stuff around and repaint that we already have. 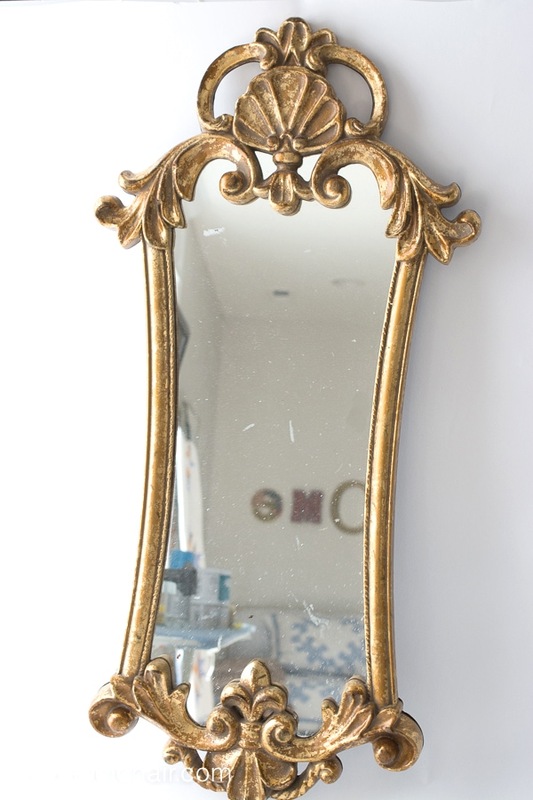 A few years ago I bought this gold mirror and never found a spot for it… I don’t know why I bought it… after I got it home it just looked too “gold” everywhere I tried to put it. 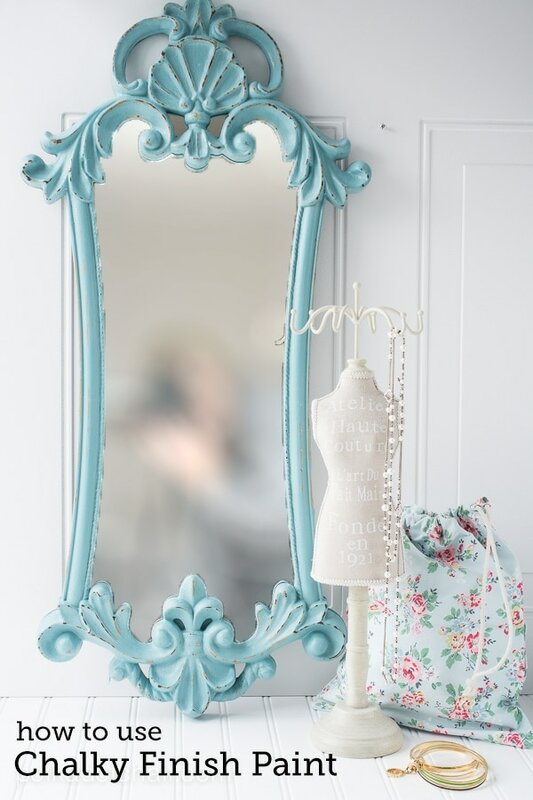 The mirror is a clever shape and I love the detail on it, it was just a bit the wrong style. Since we aren’t undertaking the big room “shuffle” til October, I thought I’d take advantage of the time I have now and start working on a few projects for my daughter’s new room. I thought the mirror would be a great place to start. I could have spray painted it, but I wanted some of the gold to show through and didn’t quite know how that would work. 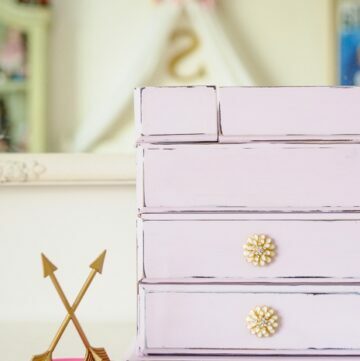 I had used the Americana Chalky Finish paint before (on this jewelry box) and it worked so great that I thought I’d use it again for this project. 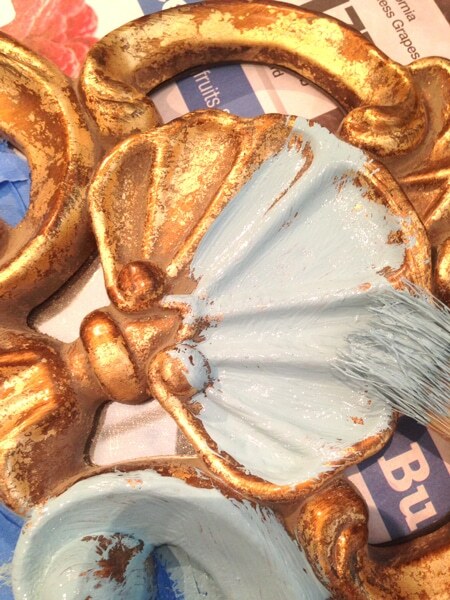 The paint it easy to apply and totally opaque, and could easily be sanded to reveal some of the gold that was on the mirror originally. 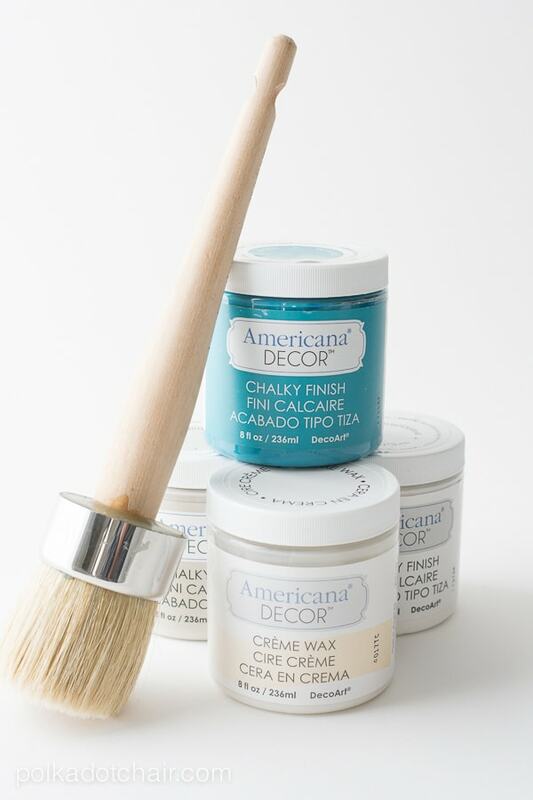 The advantage of using this type of paint is that you don’t need to do any prep work, no pre sanding or priming. 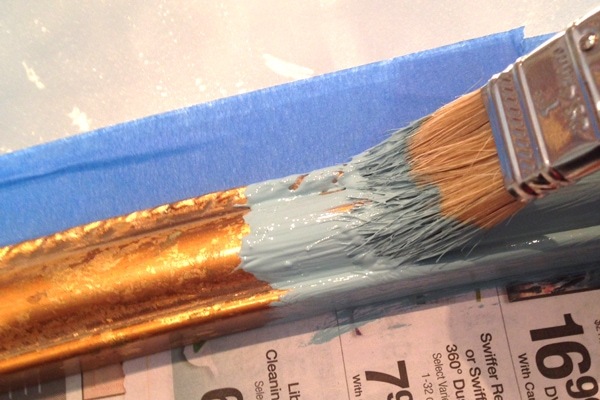 The paint is formulated to stick to a variety of surfaces and covers very well. 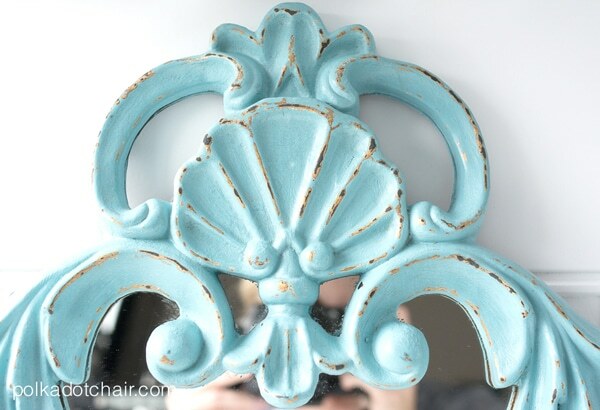 I knew that I wanted to paint the mirror a soft minty blue so I got on the DecoArt website to check out the available colors and found out that if I mix 2 colors together that I’d get the color that I wanted. 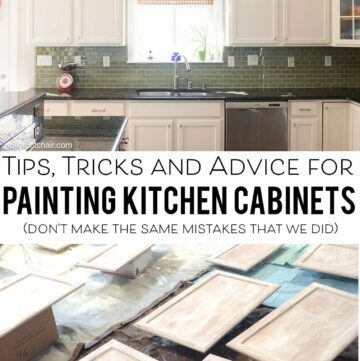 I also liked the idea of mixing colors together so that I could tweak the paint until I got just the right shade of blue. 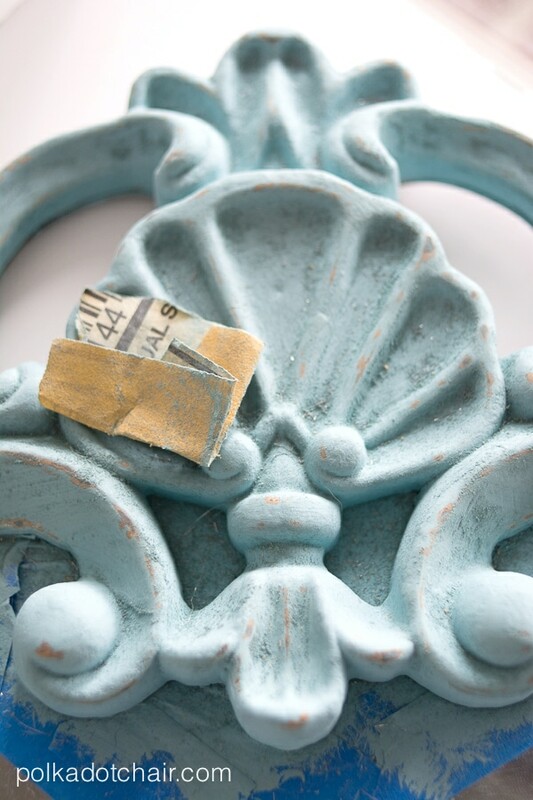 I ended up mixing 1 part Treasure and 3 parts Primitive in a small mason jar (I put it in a mason jar so that I could keep the leftover mixed paint for another project). 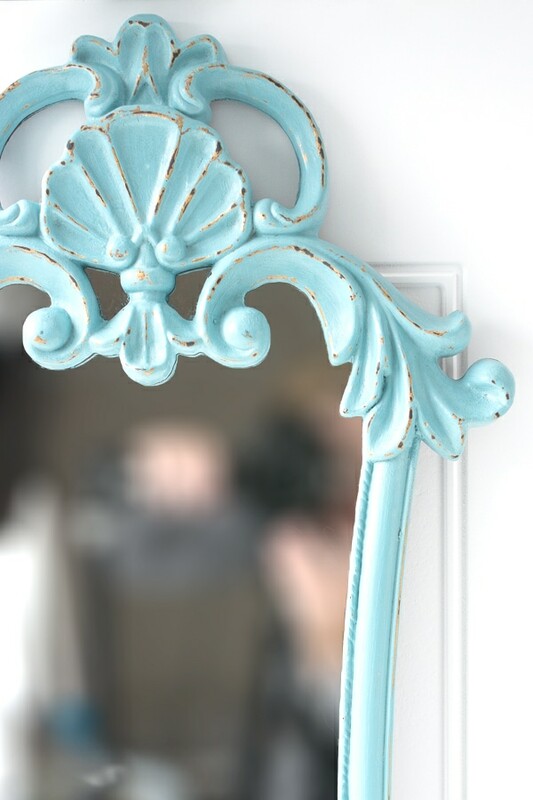 I used a paint brush and painted the frame around the mirror, I made sure that I got paint into all of the corners and crevices. It took about a coat and a half to cover the mirror. One coat probably would have been okay, but I needed a second to fill in a few spots that I had missed. After the paint was dry, I used a small piece of sandpaper to sand away some of the paint to reveal some of the gold underneath. I mostly just hit the high points on the frame. I then used a bit of steel wool to even out the surface just a bit (I did the same thing on the jewelry box redo, I think the steel wool gives it a nice smooth finish). After that I applied a thin layer of Creme Wax with a waxing brush. I let the wax dry then just buffed it with a clean cloth to give it a bit of shine. 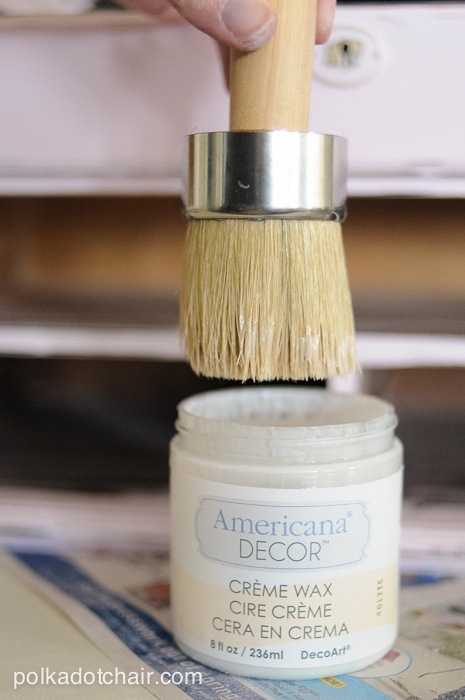 I love the combo of the chalky paint and the wax, I think it gives items such a nice finish, so much richer than using a polyurethane or spray paint. 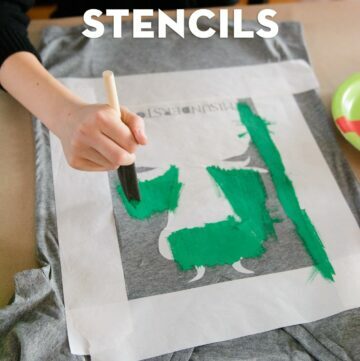 Next I’m going to use the same technique to paint some night stands and a dresser for her room (she doesn’t have either right now and she’s in desperate need of a dresser). I just need to start trolling yard sales and thrift shops for ones that would be great to paint. I keep thinking I’ll stumble on something but haven’t yet, I might have to actually START looking. This looks so beautiful!! Just pinned.